With the temperatures pointing to all things summer, I decided to take on my to-do list and begin the process of making limoncello. limoncello – n. an Italian lemon liqueur made with lemon zest, sugar, water, and vodka. It’s an easy recipe, but a slow one. It will take 60 days to complete this version of limoncello. By August, I’ll have delicious lemon liqueur to mix with soda or champagne, or even in a margarita on the rocks. 1. Wash and pat dry the lemons. Use a vegetable peeler to remove the zest (the colored portion of the peel). Leave behind the white pith, which would make the limoncello bitter. Refrigerate the lemons for another use. 3. Combine water and sugar in a small saucepan. Bring to a boil, the let boil for 5-7 minutes. 4. Let sugar syrup cool completely, then add to the vodka mixture. Stir, cover and left rest for an additional 30 days, to let the flavors further mellow and belend with the syrup. 5. Strain the limoncello through a moistened cheesecloth of coffee filter. 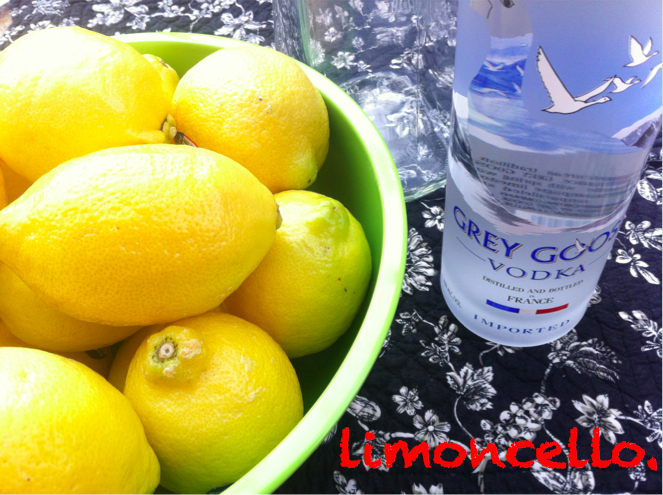 Discard the lemon zest, pour the strained limoncellon into your choice of bottle and seal tightly. 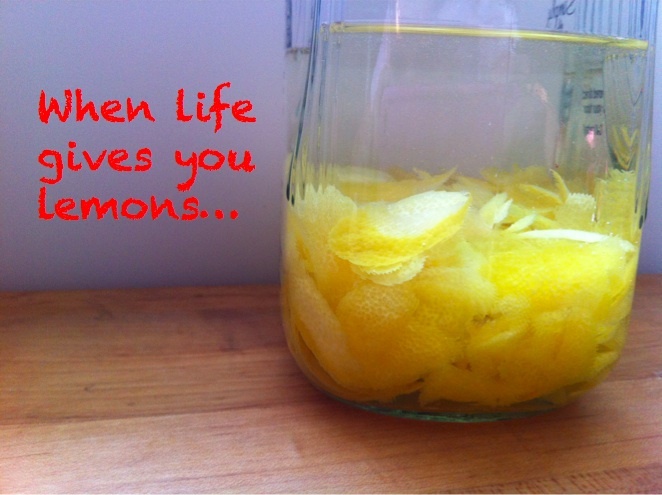 Here’s to life handing you lemons. See you in 30 days, lemony goodness! Fantastic recipe… I didn’t realise it was so simple to make (although time consuming)… I’m definitely trying this!